The coarse particulate matter (PM10) non-attainment status of the three largest cities along the international border - Nogales, Douglas and Yuma-San Luis, urged ADEQ to expand its air quality monitoring efforts to Sonoran border cities in the mid-1990s. In late 1993, ADEQ began monitoring PM10 on both sides of the border in Nogales, Arizona and Nogales, Sonora (together known as Ambos Nogales.) A study was completed in 1999, which included the following components: air sampling of particulate matter (PM), volatile organic compounds, semi-volatile organic compounds, aldehydes; air emissions inventory; air modeling and human health risk assessment. Upon completion of this project, ADEQ conducted a similar study in the cities of Douglas, Arizona and Agua Prieta, Sonora. This project included air sampling and the creation of an air emissions inventory for both cities. A number of positive actions were taken in Agua Prieta, including road paving, completion of a landfill, and tree plantings. The city had a noticeable improvement in air quality for three consecutive years, which prompted ADEQ to not proceed with the modeling and human health risk assessment phases of the study. 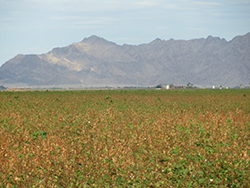 A third bi-national study began in the Yuma, Arizona-San Luis Rio Colorado, Sonora area in the early 2000s. That project was known as the Western Arizona-Sonora Border Air Quality Study (WASBAQS). Air quality monitoring and emission inventories were completed in this study. The Nogales study was the first air quality border study run by ADEQ. The first phase of the study on hazardous air pollutants (HAP) and particulate matter (PM) in the Ambos Nogales area was completed in November, 1995. The study included collecting ambient air concentrations for 60 pollutants for one year. According to U.S. EPA rules, samples were taken every sixth day, and every third day during an intensive study period in the winter. The sampling was done at the Nogales Post Office and at Carrillo Place, a residential neighborhood near the border. ADEQ contracted the services of Radian International and ENSR Consulting and Engineering to develop an air emissions inventory and human health risk assessment, respectively. The information collected through the emissions inventory was loaded by ENSR, along with meteorological data, into a three-dimensional computer model that measured pollutant concentrations in the area. The model's results were adjusted to align with the measured concentrations obtained during the sampling program. The modeling for spatial and temporal variations of HAP ambient concentrations were then used in the risk assessment study prepared by ENSR. The risk assessment examined the pollutants and the sources of the hazardous air pollutants and particulates. It concluded that the primary source of the PM10 concentrations in Ambos Nogales were a result of unpaved roads and that the main cause of hazardous air pollutants on both sides of the border were organic compounds coming from cars. A comprehensive air quality monitoring study was conducted in the Douglas/Agua Prieta area from January, 1999 to February, 2002. Its goal was to determine the physical and spatial distribution of toxic air pollutants and particulate matter in the area. Meteorological data were collected including upper air data using a wind profiler. An emissions inventory was developed for the area by a contractor with guidance from ADEQ staff. As part of the emissions inventory development, ADEQ staff used a new approach; coupling Geographic Information System (GIS) software with satellite image processing software to analyze high-resolution satellite images. This allowed staff to more accurately identify and locate land uses that contribute to air pollution, such as land with disturbed topsoil, vacant lots, agricultural land, and roads. The emissions inventory helped identify and quantify sources of air pollution in the Douglas/Agua Prieta area. Sources included vehicles, maquiladoras, and disturbed land. With funding provided by U.S. EPA Region 9 , ADEQ conducted a bi-national Air Quality Study for the Western Arizona-Sonora Border Region. This study is considered the largest bi-national air quality study ever done in the this region. It determined the type and sources of harmful compounds in the air. The air sampling and meteorological monitoring phase of this study took place in 2003-2004. This was followed by an emissions data gathering effort completed in 2006. The emissions inventory includes an evaluation of the contribution of the various emissions sources, as well as an analysis of various potential emission reduction techniques. 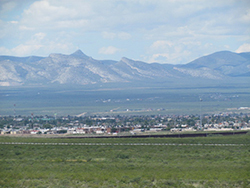 In the summer of 2011, ADEQ discontinued its cross-border air quality monitoring program in San Luis Rio Colorado, Agua Prieta and Nogales, Sonora due to lack of funding. At the end of 2011, the State of Sonora Commission on Ecology and Sustainable Development (CEDES) enacted a statewide air quality monitoring program, which included stations in Agua Prieta and Nogales, and committed to sharing the data with ADEQ. However, that effort lasted for a year and the data that was collected did not meet the Quality Assurance/Quality Control (QA/QC) standards required by ADEQ. 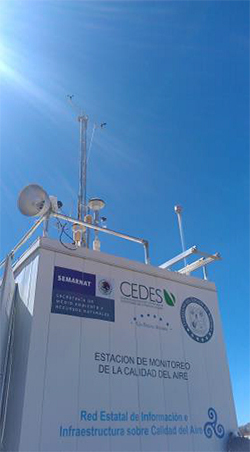 The PM10 equipment that had been operated and maintained by CEDES at the Nogales, Sonora Technological Institute (ITN) was repaired and re-installed by Sonoma Technology, Inc. (STI) in August, 2014, with funding provided by US EPA Region 9. OBEP staff are providing support with the day-to-day operation and maintenance of the equipment for at least one year in order to ensure adequate data recovery. All data collected at that station will be accessible to the public. ADEQ continues to conduct ambient air quality monitoring throughout Arizona. Environmental criteria measured in this monitoring network include pollutants (O3, SO2, PM10, PM2.5, CO, and Pb), air toxics, and meteorology. The following link provides access to a description of the ADEQ Air Monitoring Network. ADEQ has air quality monitoring stations in each of the three largest Arizona border cities - Douglas, Yuma, and Nogales. Another particulate matter monitoring station is located at the Paul Spur lime plant in Cochise County. Over the next year, continuous PM10 and PM2.5 monitors will be installed at the Nogales and Douglas monitoring stations. A description of each site can be found by clicking on the link above and scrolling down, or by clicking on one of the following links to access a specific part of the document. When an area within the state violates federal Clean Air standards, ADEQ develops State Implementation Plans (SIPs) to identify the sources of pollution in an area and air pollution strategies that will help to bring the area back into compliance. Pollution caused by particulate matter (PM), is one of the main causes of harmful air quality in the border region. ADEQ has identified burning wood and garbage, soil erosion, vehicle emissions, unpaved areas and traffic congestion as contributing factors for this type of pollution. Over the years, several projects addressing these problems have been implemented and there have been some encouraging results. However, continuing collaboration with partnering agencies and community groups provide more sustained results. For more than a decade, the Arizona/Sonora Border Clean Air Calendar was the main tool used to disseminate environmental information to the public. The calendar’s pictures were drawings made by students from both sides of the border. The financial support for the calendar was provided by the US Environmental Protection Agency. The last issue of the calendar was for 2014. To view this last edition, access the first link of the list below. Outreach efforts disseminate both environmental education and results of applied projects. ADEQ and other institutions working in the region have acquired a considerable amount of information that is available to the public. The following links include access to daily air quality forecasts for the Nogales and Yuma areas, as well as other sources of related information. This section describes OBEP’s accomplishments in the border region regarding projects and activities related to air quality. A summary of these projects can be found below. Between 2005 and 2010, ADEQ conducted several projects focused on retrofitting buses used by schools or school districts within Santa Cruz County. ADEQ also led projects to retrofit diesel haul trucks that frequently cross the border at Nogales' Mariposa Port of Entry (POE). These projects were grant-funded by the U.S. EPA, with funding being delivered either directly to ADEQ or through the Border of Environment Cooperation Commission (BECC). ADEQ conducted a project to retrofit school buses at the Santa Cruz Valley Unified School District (SCVUSD). The school buses were retrofitted with either Diesel Oxidation Catalysts (DOCs) or Diesel Particle Filters (DPFs), which provide 20-30% and 90% reduction in particulate matter emissions respectively. 31 school buses were retrofitted: 28 with DOCs and three with DPFs. The use of biodiesel fuel (B20) provided an additional 10% reduction of diesel emissions. SCVUSD provided a nearly 80% cost match to leverage funds for the purchase and installation of a storage tank to be used exclusively for biodiesel fuel. This project was initiated after the SCVUSD retrofits were completed. Only DOCs were installed on five NUSD school buses and three Little Red Schoolhouse school buses. The use of biodiesel was suggested, but never implemented due to the lack of a local provider. The Patagonia region was added to the original Nogales area project after receiving extensions of time and funding. Eight buses were retrofitted with DOCs. ADEQ conducted two separate projects to retrofit diesel haul trucks that frequently cross through the Nogales Mariposa Port of Entry. The Mariposa Port of Entry is one of the busiest commercial land ports in the U.S., serving as a main entry point for fresh produce coming from Mexico. It has been estimated that during the annual winter produce peak season from November to March, approximately 136,000 trucks arrive from Mexico to haul produce to the warehouses in Nogales, Arizona, and approximately 200,000 U.S. trucks arrive at these warehouses to pick up the produce for distribution. Vehicle emissions have been identified as one of the main polluting factors in the region and both the long haul trucks and short haul (drayage) trucks crossing the border transporting goods between the two countries are contributors of these emissions due to the high number of these vehicles and the frequency in which they cross the border. Drayage trucks, which are only allowed to travel up to 25 miles on the U.S. side, circulate between the warehouses on both sides of the border, off-loading and re-loading produce and goods. Since these trucks are older and in poorer condition than typical long haul trucks, their emissions are higher. In order to help reduce the diesel emissions produced by these trucks, ADEQ conducted two separate projects to retrofit these types of vehicles. Working with both the Arizona Department of Transportation (ADOT) and the Nogales, Sonora office for Mexico's Secretariat of Transportation and Communications, these projects identified potential trucks to be retrofitted, and the correspondent technology that could be installed. 71 diesel trucks were retrofitted with DOCs. Removal and disposal of outdated chemicals. 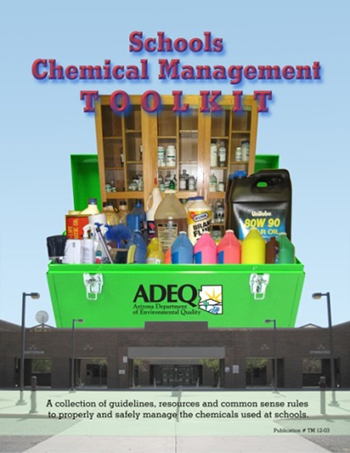 Developing a Schools Chemical Management Toolkit. Developing a Schools Chemical Management Plan. Outreach efforts have been an important part of the activities that OBEP performs along the Arizona-Sonora border. The goal is to disseminate information about environmental topics relevant to the region, as well as to inform the public on the type of projects and specific activities that are carried out. Specific to air quality, these outreach efforts have primarily taken the form of printed materials and short radio programs in partnership with local government, academic and community partners. One such tool is the Arizona/Sonora Border Clean Air Calendar. The main pictorial material for the calendar consisted of artwork produced by students from both sides of the border, depicting their ideas and solutions for air quality issues. 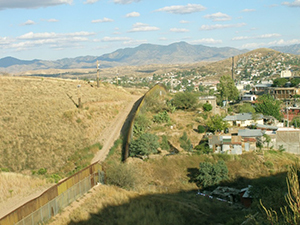 The calendar started in the Ambos Nogales region, but was briefly expanded to two other Arizona-Sonora border sister communities – Yuma/San Luis R.C. and Douglas/Agua Prieta. For over a decade, between 2001 and 2013, this outreach effort was financially supported by Region 9 of the US Environmental Protection Agency. The last edition of this calendar for 2014, can be viewed at the following link.